Father-and-son team John and Steve Murray operate Murray Homes, a luxury custom home building company, originally created in the 90s. Since the inception of their business, the family-owned company is committed to constructing one-of-a-kind residences that their clients adore. The duo has built more than 100 homes along the Sarasota, FL waterfront. For John’s upcoming 70th birthday, Steve signed them up to participate in the Fireball Run, an annual nationwide race that helps build awareness for missing children. Fireball Run is a 2,000-mile life-size trivia game that is simultaneously a live event and a streaming TV event. Driving teams spend eight days driving around the country hitting assigned destinations. Each team is assigned a missing child from their city of origin. In the team’s 2,000-mile driving journey, they are tasked with distributing 1,000 flyers with the missing child’s image and pertinent information. This year, the theme is Space Race, and racers begin their journey on September 25 in Hartford, CT. They then travel to Queen Anne’s MD; Williamsburg, VA; Topsail Island, NC; Florence, SC; Liberty County, GA, respectively; finishing the race on October 3 during a city-wide parade finish in Cocoa Beach, FL. In season 9, four astronauts from around the globe, four celebrities, and 40 multinational driving teams will compete for bragging rights, the first to pass the finish line, and a plastic road sign declaring their victory. John and Steve will be racing on behalf of Jennifer Marteliz, who has been missing since November 1982 from Tampa, FL. 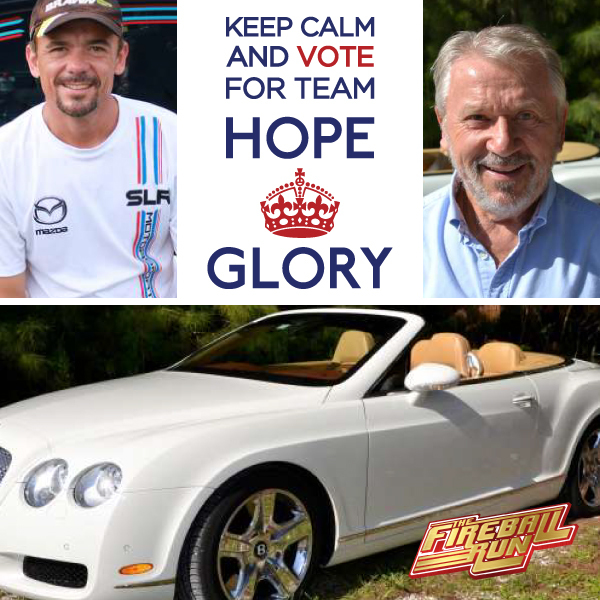 With previous experience as a racecar team who have competed regularly at Sebring, Daytona, and Homestead, the father-and-son duo hopes to “raise a lot of money for a good cause, meet a lot of people, and tear up the East Coast.” To virtually cheer on the team as they embark on their eight-day adventure, vote online for team Hope and Glory here. You can watch all the excitement and thrilling adventures in real time as John and Steve compete in daily challenges with trivia-based clues to unlock extraordinary experiences. The challenges range from historic to physically tough — picture ziplining in forests — to emotional. Follow team Hope and Glory as each episode airs here.